Interestinger and interestinger. More good news about international oil & gas getting back in the game again after getting burned big time by the last oil price crash. Pay attention, a shift is starting to happen, as return on investment is apparently starting to take priority over increasing production. Who woulda thunk it? Common sense is apparently becoming more common. Does resurgence of off-shore now that deepwater breakeven, per Shell Oil, is sub $30 bbl . . . mean that Shale has lost its shine ? Listen to Chevron CEO interview. Greatest return on capital is shale . Less than 2 years Chevron Shale will be very cash flow positive , self capitalize and provide great returns to shareholders. Chevron also has deepwater growth referencing (like Shell) greatly reduced breakeven. As Chevron stated "CUT COSTS OR DIE"
SHALE, DEEPWATER AND CONSUMER ALL WIN. The only LOSERS ARE THOSE " OLD SCHOOL" HACKS THAT DONT WANT FREE MARKETS IN THE OIL INDUSTRY. The Smart Operator's realize they have to reduce costs and reduce breakeven . If you are a National Oil Company and oil funds a majority of your Nations budget you have a difficult problem. What about Brazil PreSalt ? per﻿ ﻿Shell Oil, is sub $30 bbl . . . mean that Shale has lost its shine ? No worries, I'm just shooting off my own opinion. Doesn't mean I'm right or wrong. I just call 'em as I see 'em. Not necessarily. That would actually be a very optimistic scenario in which demand is surging at breakneck speed and there's no cheaper alternative to U.S. light crude. 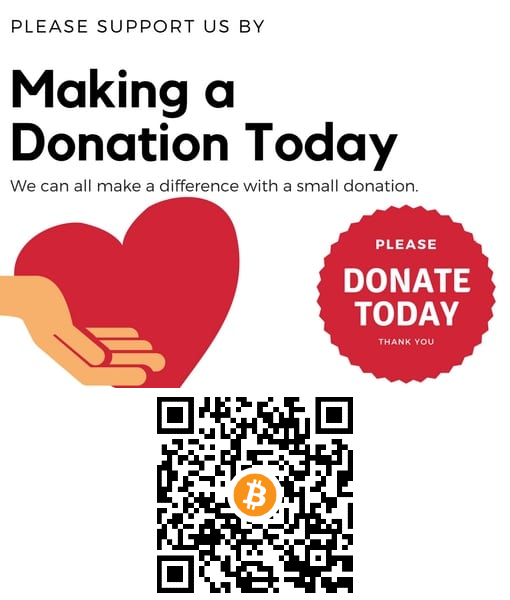 Please re-read your link above. For one, EIA guesstimates. Their track record of guessing years out as with any forecasting entity. Wildly wrong and the smart investors know better to bet for or against the oil patch more than a year out. 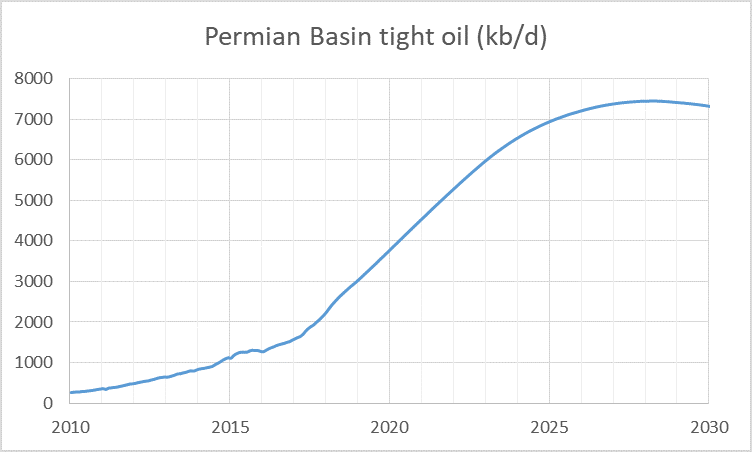 The pipeline takeaway is gathering steam and sooner than later the Permian will be producing double what it is now. One major 1mmbd line to Corpus already folded as 3 other lines are outpacing them and wont be a reason for their line. One thing is certain, nothing stays the same, drilling practices, to completion have all changed in 30 years. Tell me how the EIA will have guesstimate 30 years out? Hydraulic fracking, which injects water mixed with chemicals to penetrate shale formations, is controversial. There are more than 700 studies that have focused on potential risks, with a high number of them showing risks or actual harms, Forbes reported. New York, Vermont and Maryland, which has proven gas reserves, have laws banning fracking. I would say Forbes ought to just stick to what it does best, steal investors money. Opinions such as theirs I give no credence too. If NY and Vermont and Maryland want to buy other states gas and oil, I say make 'em pay a premium. Where did I say I concur with EIA's estimates to any degree? Does resurgence off off-shore now that deepwater breakeven, per Shell Oil, is sub $30 bbl . . . mean that Shale has lost its shine ? Listen Chevron CEO interview. Greatest return on capital is shale . Less than 2 years Shale will be very cash flow positive , self capitalize and returns to shareholders. Chevron also has deepwater growth referencing (like Shell) greatly reduced breakeven. As Chevron stated "CIT COSTS OR DIE"
SHALE, DEEPWATER SND CONDUMER ALL WIN. The Smart Operator's realize they have to reduce costs and reduce budgets . If you are a National Oil Company and oil finds a majority of your Nations budget you have a different problem. My estimate is more like 12-14 Mb/d in about 9 years for US tight Oil (11-12 Mb/d) and US GOM output (1-2 Mb/d). Eventually sweet spots in tight oil plays will run out of space and well productivity will decrease, then costs go up and well completion rates gradually decline, the same will occur in every oil basin throughout the World, though at different times, peak oil output is likely to occur between 2020 and 2030, my best guess being 2025. Much will depend on future oil prices which are difficult to predict. If the EIA's AEO 2019 reference oil price case is close to correct, then 2025 becomes a better guess for peak oil, higher prices might push the peak to a later date with steeper declines after the peak and lower oil prices might lead to an earlier peak with more gradual decline in output after the peak. Of course nobody really knows, but we probably won't see Venezuela recover very soon, and Canadian output is based on CAPP forecasts, LTO based on USGS estimates and well profile information through 2017 and World conventional C+C URR (where conventional excludes extra heavy oil from Canada and Venezuela and tight oil output) of 2800 Gb. My estimate is more like 12-14 Mb/d in about 9 years for US tight Oil (11-12 Mb/d) and US GOM output (1-2 Mb/d). Eventually sweet spots in tight oil plays . . . US is producing 12.1 Mil bbls/day now. Gulf Mexico just recorded record daily production of 1.67 Mil bbls/day. The US Gulf resurgence it just starting . . . . It will take a little longer to ramp. When it does it will be big and will flow for a long time at high flow rates. Currently US tight oil (7.5 Mb/d) plus GOM (1.7 Mb/d) is about 9.2 Mb/d, and Jan 2019 US C+C output was 11.9 Mb/d, the weekly estimates are often inaccurate by as much as 300 kb/d and I ignore those. The other 2.7 Mb/d is from US output that is neither tight oil nor GOM output. You specifically said tight oil and GOM output, so I assumed you were deducting other US output as I have done. If you were assuming the US "other output" (not tight oil or GOM output) was roughly constant at 3 Mb/d, and including it in your 16 to18 Mb/d estimate then our estimates would be much the same ( mine would be 15 to 17 Mb/d, but in 9 years rather than in 5 years for your estimate, I doubt the ramp up will be as quick as you foresee). Also the ramp up of some projects will be offset by declining output from older wells, I doubt the GOM output will be as high as envisioned by the EIA, probably flat for 5 to 10 years and then declining thereafter. I agree Permian output will increase and then it will decrease. I expect the peak will be in 2028 at about 7500 kb/d and expect output will double by about 2022 (from 3000 kb/d at the end of 2018 to 6000 kb/d by the end of 2022). 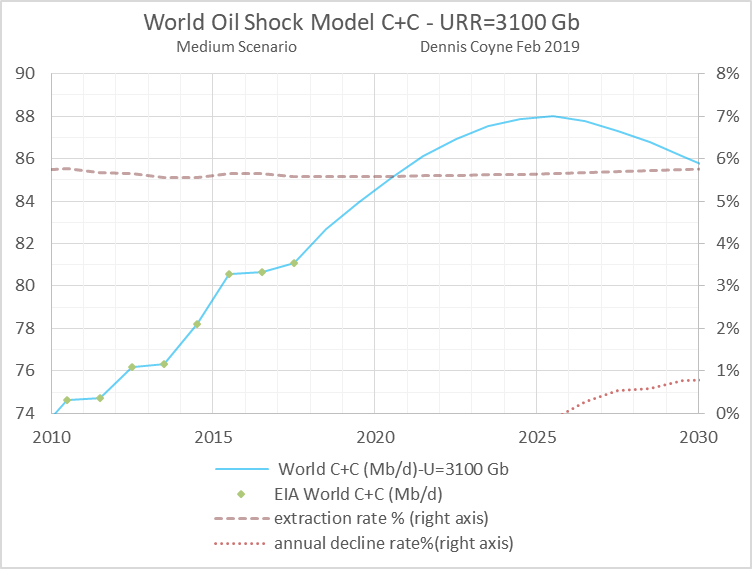 URR to the end of 2050 about 57 Gb, if the EIA's AEO 2018 reference oil price scenario is correct. I agree nobody knows the future, but I figure the EIA's guess is as good as any. There are an infinite number of possible future outcomes for oil output and oil price, the odds that any forecast of the future is correct is very low, about 1/infinity. The steep initial declines found in ALL Shale wells in ALL regions is significant when compared to large elephant reserves found offshore. The amount of infrastructure to make the Permian machine work, including getting product to the Gulf Coast is noteworthy, balance that against the infrastructure already in place offshore Gulf of Mexico. I agree that the big money will soon recognize this, if they haven't already done so.